The recipes in this list do exactly that, they provide ways to get chocolate (or cocoa) into savory dishes and into your dinner. In many cases, the chocolate adds a subtle flavor to the overall recipe that helps to make it just that much better. If nothing else, you might be surprised at the range of different types of recipes that make use of this dessert staple. As these recipes show, chocolate is actually a lot more versatile than most of us assume. Besides the taste of chocolate, there is also a growing interest in the health benefits that it offers, especially when you consider the flavanols in dark chocolate. So, including chocolate in a dinner recipe might prove to be a surprisingly healthy approach to cooking. If nothing else, you're bound to give any dinner guests something to talk about. This recipe comes from thevegan8.com, which does also mean that the recipe is vegan. 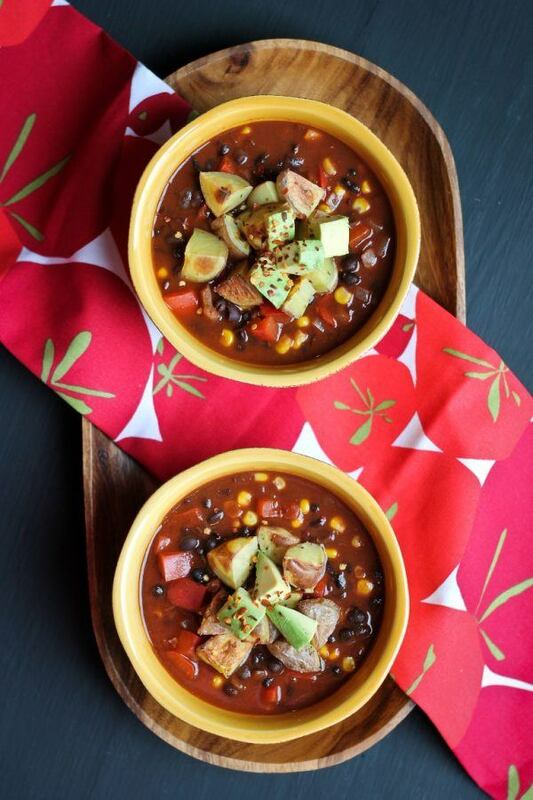 Chili is one of the few savory recipes where chocolate seems to be a fairly common addition. Perhaps that's not too surprising, as chocolate does seem to pair well with some of the flavors that you find in chili. The author notes that in this recipe, the cocoa acts to provide a rich depth of flavor, rather than actually making the dish taste like chocolate. So, this would make the recipe an especially interesting one if you are trying chocolate in a savory dish for the first time. 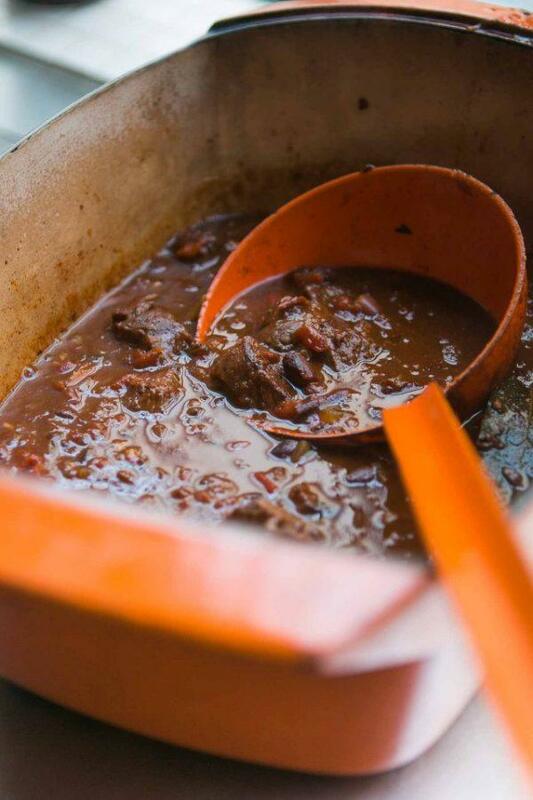 This recipe is another example of including chocolate in chili, although this time the recipe itself comes from leitesculinaria.com and as the title suggests, this version of chili is especially popular in Cincinnati. The creator notes that Cincinnati chili is different than many other types of chili, with more spices and a different texture. This is also a recipe that actually uses chocolate itself (dark chocolate in this case) rather than cocoa. I've never tried this type of chili myself but I have to admit that I love the way it looks in the bowl. 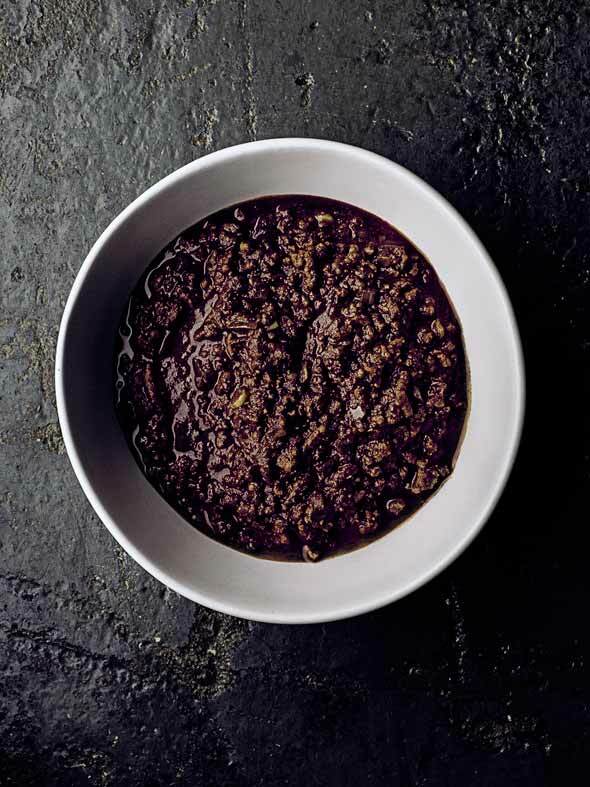 Chili is one use of chocolate that appears to be fairly common but an even more common approach is in mole sauce, traditionally used in Mexican cooking. The term actually refers to a range of different types of sauces, however many of these do include chocolate as a key ingredient. As with chili, the chocolate plays a key role in deepening the taste of the recipe and the chocolate also helps to offset some of the heat that comes from the chili peppers. This particular recipe comes from thebeeroness.com and, as the name suggests, it is also a recipe that contains beer. Personally, I love the way this dish looks and it is bound to taste amazing. While we're on the topic of Mexican and Mexican-inspired food, here is another recipe that fits the theme. This time, the recipe comes from wildflourskitchen.com and it is for tacos that are served with a chocolate-containing sauce. The fun thing about this recipe is that it's fairly easy to prepare and the end result does look quite stunning visually. 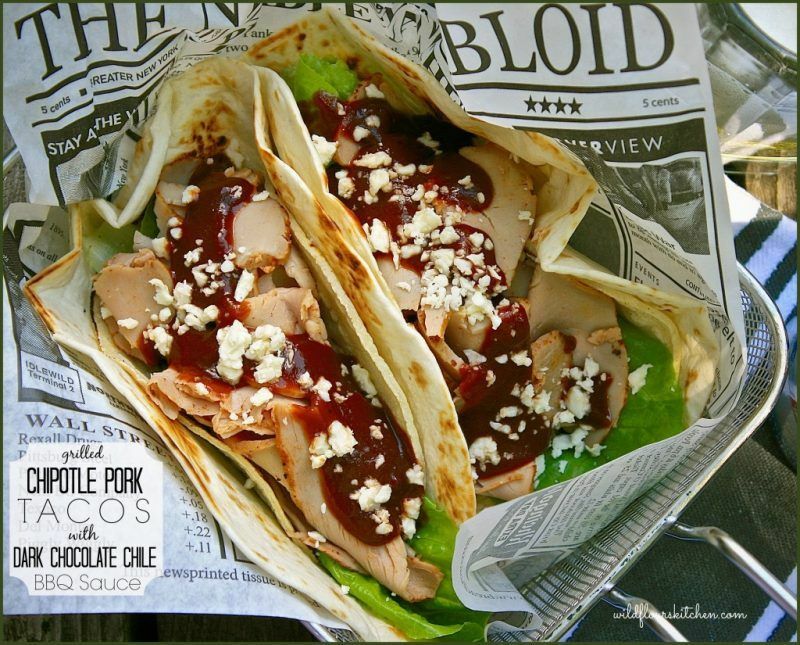 You could also choose to just make the barbecue sauce and use it for a completely different purpose if you wanted to. I'm probably biased by my own taste preferences but I think this is my favorite example of a chocolate-containing recipe for dinner. 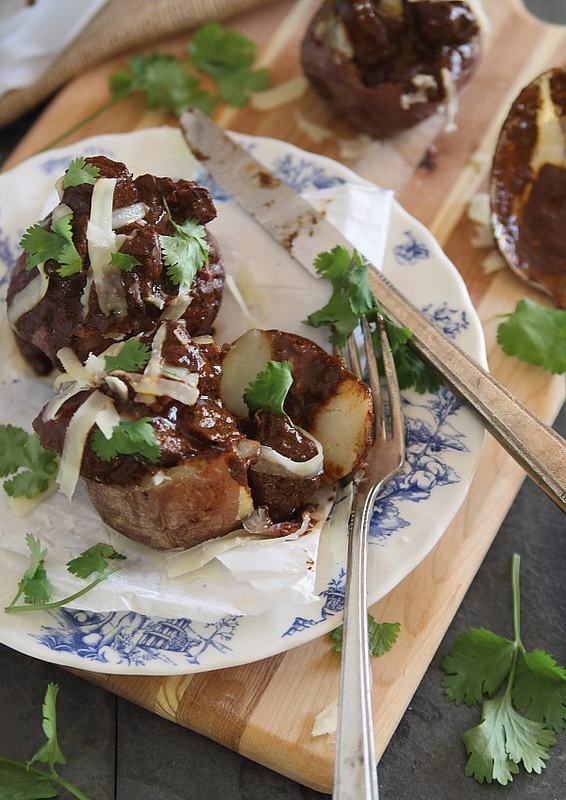 On its own, red wine beef stew can be a perfect option for winter and can offer a very appealing flavor. When you add in potatoes to the mix and chocolate, the overall dish just gets that much more interesting. The recipe comes from runningtothekitchen.com and it would be a great recipe for winter or any time that you wanted a warming and hearty meal. This is the first recipe on the list where the use of chocolate (well, cocoa in this case) is actually noticeable and the ribs do end up looking really cool. I love the combination of flavors for this recipe, because you've got coffee, chocolate and chili, and none of those flavors are especially common on ribs. 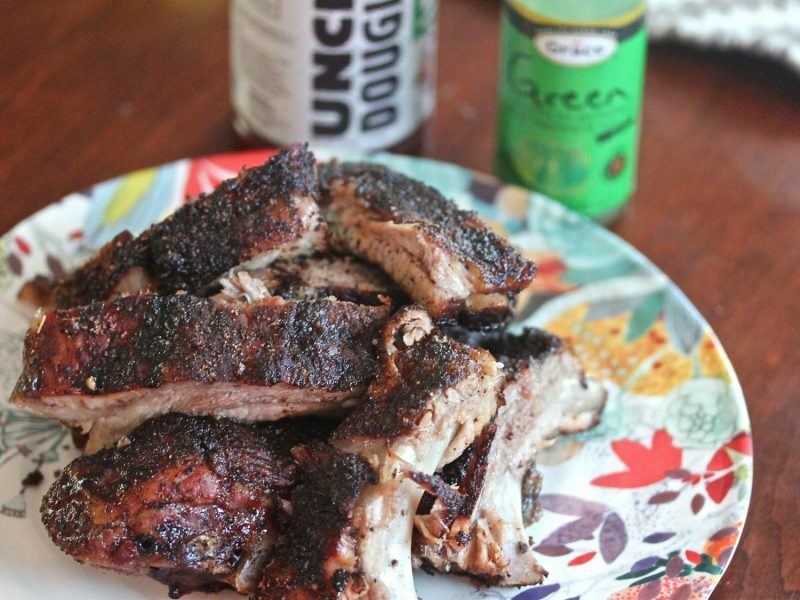 However, the flavors sound like they would work extremely well and they would be a fun choice if you wanted to make ribs that were a little bit different. All of the details for this dish can be found at seriouseats.com and it's worth taking the time to check out the recipe. Okay, I admit that this recipe is a little bit borderline. Most people don't have grilled cheese for dinner, although I'm sure that just about everyone has done that at least once when there was nothing else in the cupboard. Likewise, this recipe could really be considered sweet or savory. Nevertheless, the recipe is a particularly fun way to get chocolate in a recipe that you wouldn't expect and it also offers an extremely unusual combination of flavors. I personally have no idea how the end product would taste but I find that I'm actually pretty interested in giving it a try. Besides, the recipe comes from ambitiouskitchen.com and the recipes on that site are normally very good. 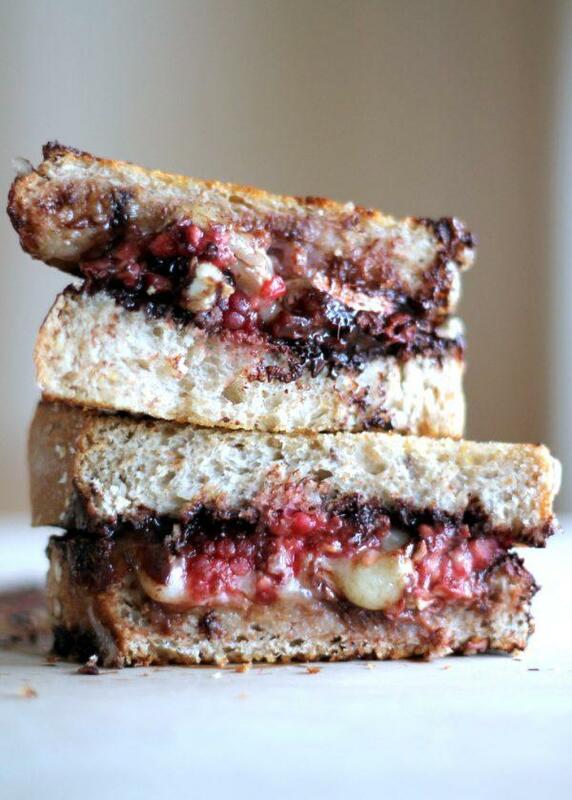 This recipe comes from savorthebest.com and it's one that gets the chocolate flavor from cocoa. One of the best things about this particular recipe is that it happens to be so versatile. After all, barbecue sauce ends up being used in so many different dishes and that doesn't even count all the times that you use barbecue sauce on the side. 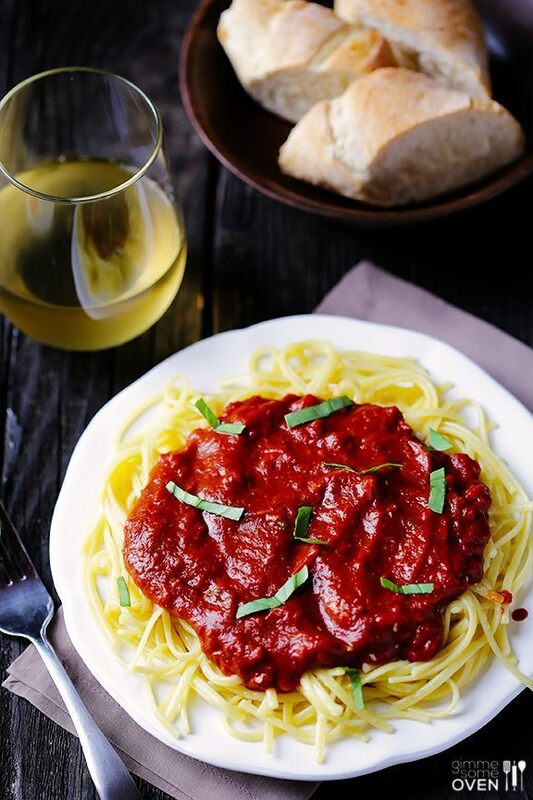 The flavors used in this recipe would be an appealing way to make a sauce that is a little unusual and is certainly interesting. I did say that chocolate seems to be common in chili, so it shouldn't be too surprising that I've got three such recipes on this fairly short list. Now, this particular recipe might seem simple based on the name but it is still a chili recipe so it does involve a range of ingredients and preparation. Still, it's another good alternative if you're thinking of trying out the idea of including chocolate in chili and you can find the full instructions for the recipe at davidlebovitz.com. This chocolate-containing recipe comes from gimmesomeoven.com and you have to admit that it is pretty unique. This is the first time that I have heard of putting chocolate in a marinara sauce and the recipe does actually use chocolate rather than cocoa, which makes it extra special. In her discussion of the recipe, the author comments that the chocolate adds a subtle complexity to the dish but doesn't overpower the other flavors. Personally, I think this dish would be a lot of fun to try. It would also work really well if you wanted to make marinara sauce that was just a little bit different. This recipe has a lot of different flavors and in many ways, chocolate isn't the main one. 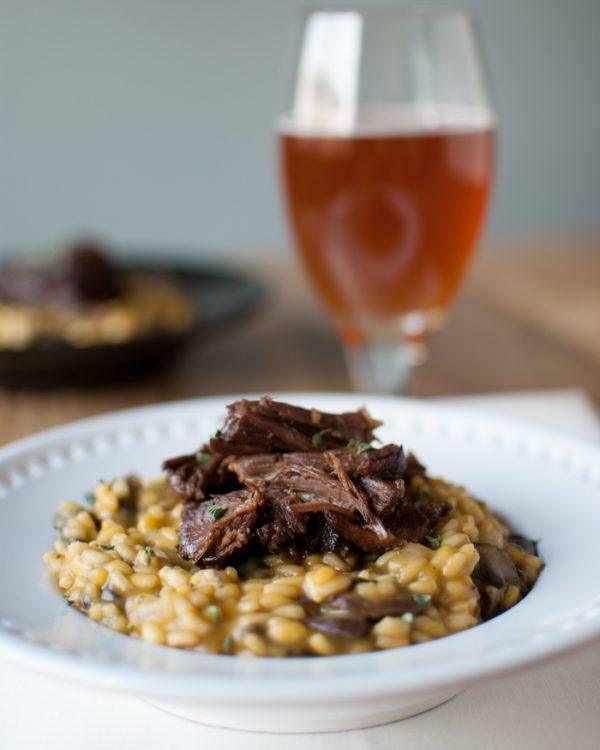 In fact, the original recipe focuses more on the pumpkin risotto than on the ribs. But, we're talking about chocolate today, so the ribs are the part of the recipe that I'm the most interested in. The instructions are separate on thedevilwearsparsley.com, so you could actually just make the ribs (or the risotto) if you were included. Personally though, I would try the whole thing together once because the flavor combination does sound pretty appealing. 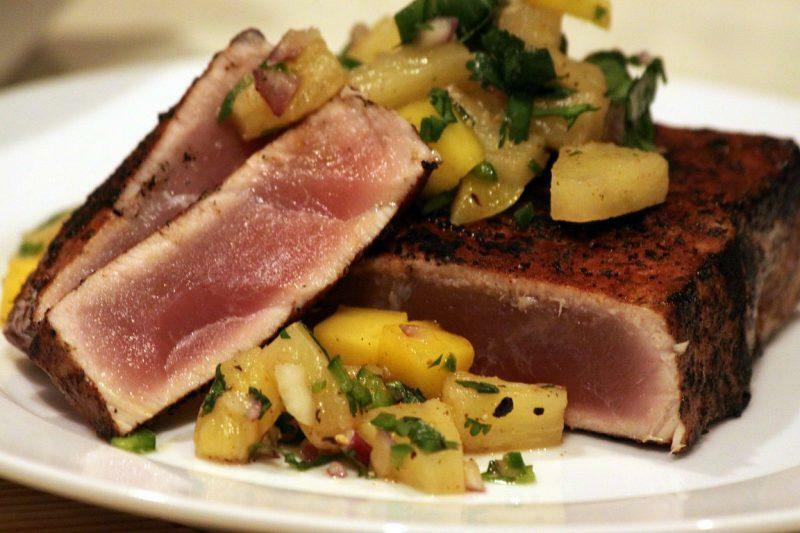 Just as an introduction, ahi is actually a type of fish and it tends to be served rare, like you see in this recipe. In fact, ahi is sometimes thought of as an alternative to steak, especially as the taste is much more similar than you would expect. As the name for the recipe suggests, cocoa is used to crust the recipe, helping to create an appealing overall flavor that would contrast nicely with the fruit salsa. You can find the recipe for both the fish and the salsa at homesweetjones.com if you're interested in taking a look or giving it a try. Speaking of fish, here's a second recipe that combines the flavor of fish with that of chocolate. However, this recipe is a bit different because the emphasis isn't on the fish at all but on the mole sauce. 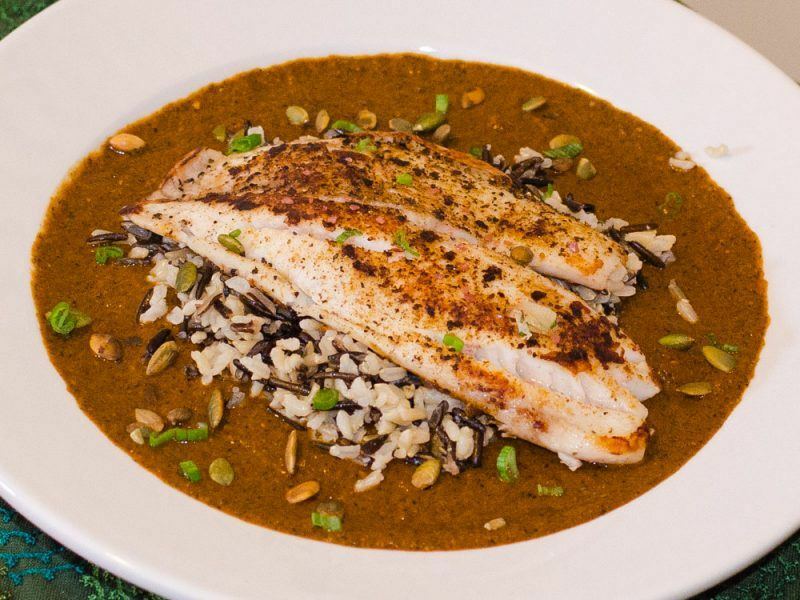 In fact, the recipe itself is just for mole sauce and the author simply suggests basic preparation approaches for the fish and for the rice. I have to admit though, the combination of flavors and the colors in the dish does work well. 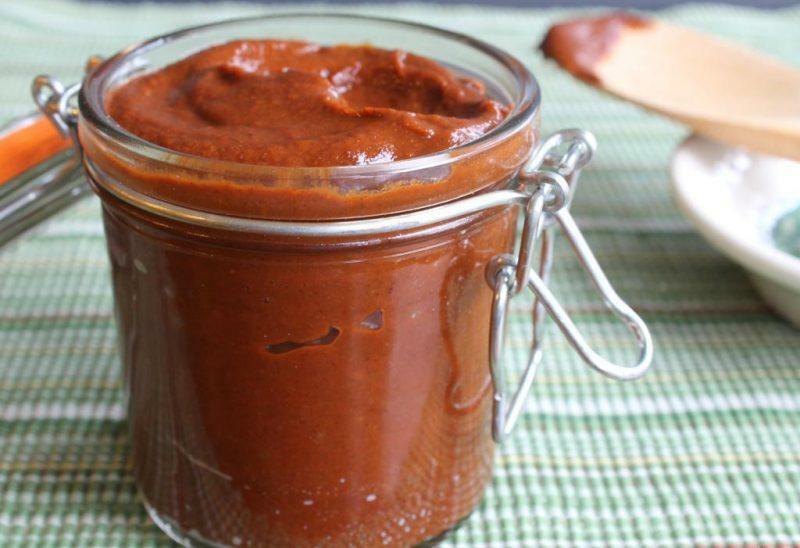 The recipe for the mole sauce comes from simpleawesomecooking.com and it is easy to follow even if you have never tried mole sauce in the past. 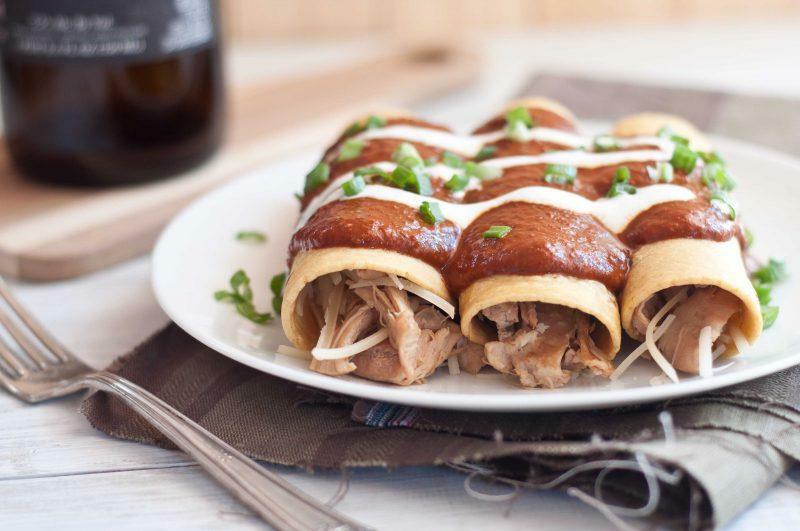 The recipe seems to have been designed with this in mind, as the author was trying to get the key flavors of mole sauce while also simplifying the process of creating the sauce. 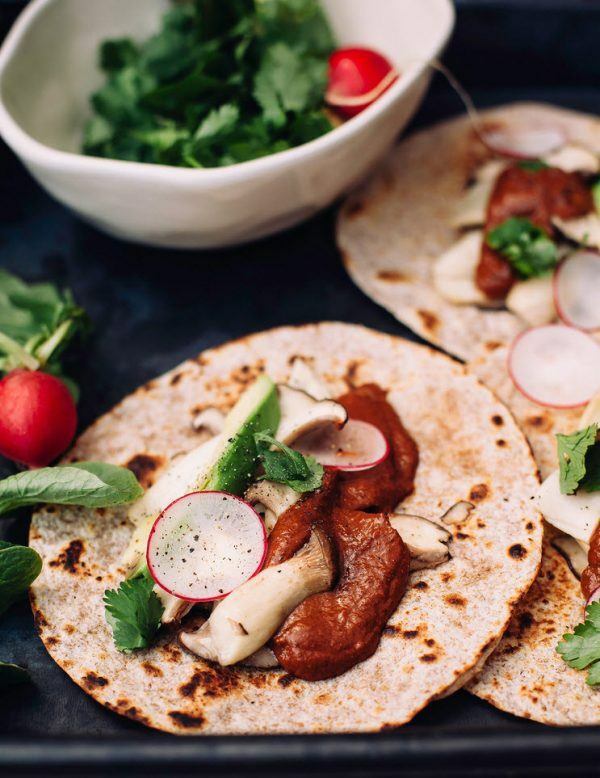 This recipe is a vegan version of tacos and I love the way that the finished dish looks in the images. As you can probably imagine, there are two main components to this recipe. One is the sauce itself and the other is the rest of the taco. On the site, the information for the sauce is given separately, so you could make just the sauce or go ahead and make the whole thing. As with the other recipes that I've featured here, it seems like the chocolate adds in a bit of depth to the flavor without overwhelming any other tastes. In this case, you can find all the details you need to make the recipe at thefirstmess.com. When I first saw this recipe, I assumed that the chocolate would be in the ketchup. After all, most items on this list have included the chocolate in some type of sauce or liquid. But, that isn't actually the case. Instead, the chocolate is part of the burger patties themselves. The idea is certainly unusual and I don't actually have any idea what it would taste like. 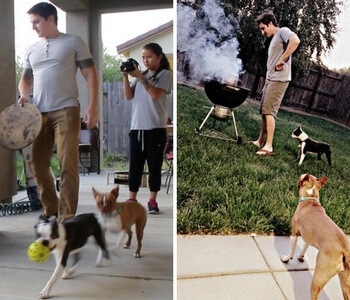 However, I love the idea. 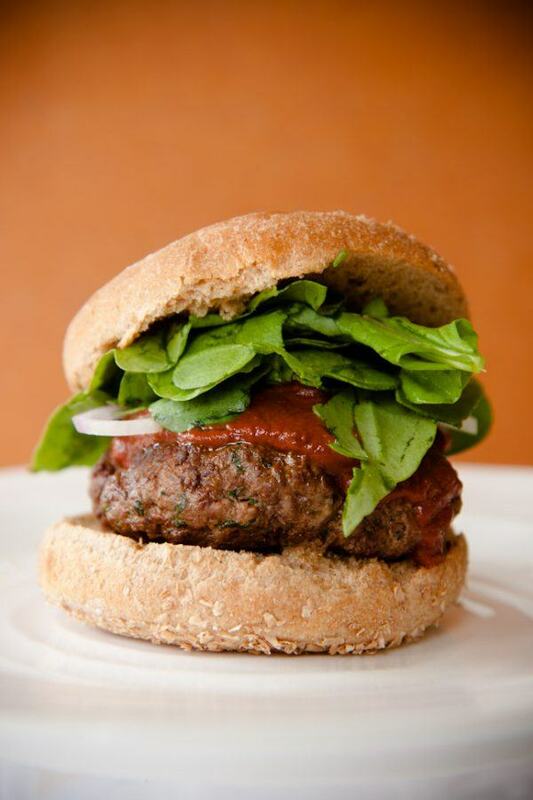 Besides, chocolate does seem to work surprisingly well in savory dishes, so I have no doubt it will work great in this burger too. You can find the recipe at cupcakeproject.com along with information on how to make the homemade ketchup that it is served with in the image. Thank you very kindly for including my Chipotle Pork tenderloin tacos in this fantastic recipe roundup! I very much enjoy cooking with chocolate, and I’m thrilled to see so many others that do as well!! I have a new one that you might also like to try, my hubby and I were in chocolate rib nirvana over these! ( Recipe: http://wildflourskitchen.com/2016/04/27/cabernet-dark-chocolate-boysenberry-baby-back-ribs/ ) Thanks again so very much! Have a fantastic day! OMG those do sound delicious! Dark chocolate and boysenberry sounds amazzzzzzziiiiiiiing!